Every time Manda Grover received a pregnancy scan, the expecting mom felt pressured to abort her unborn baby boy. Grover said the pressure began when a test revealed that one or both of her unborn twins may have Down syndrome. In an article at the Daily Mail, Grover and her husband, Richard, of Horsham, West Sussex, explained how they had to continuously defend their decision to choose life for their unborn son, no matter what his condition was. “It’s hard to believe that if I’d taken the advice of many people along the line, my beautiful boy would not be here today,” Manda said. The Grovers said they tried to conceive a child for six years before turning to in vitro fertilization. Two attempts failed, but on the third, Manda became pregnant with twins, according to the report. 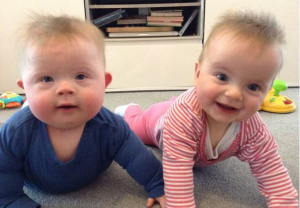 When she was 12 weeks along, Manda had a screening test that revealed that the twins may have Down syndrome. After more testing, doctors told the Grovers that their unborn daughter had a one in 80 chance of having Down syndrome, and their unborn son had a one in eight chance. Despite her determination, Manda said she continued to feel pressured to abort her son. “At every scan after that – and I was given more than normal because of my age and the fact that I was having twins – I was asked about whether I was happy to continue with the pregnancy,” Manda said. “Needless to say, of course I was but the question became hurtful and tedious. Nothing had ever been confirmed 100 per cent that he had DS, but Richard and I had accepted that he did and started reading up on the syndrome,” she continued. On Oct. 10, 2015, the twins arrived. When the Grovers looked at their son, they knew for sure that he had Down syndrome, but it did not make any difference to them. They were happy to finally have the children that they had longed for. Their doctor did not have the same attitude. The discriminatory attitudes that the Grovers faced are not uncommon anymore in the medical community. Parents whose unborn babies have Down syndrome or other disabilities frequently report feeling pressure to abort them. Last year, a Florida mom’s letter to her doctor went viral after she exposed how the doctor pressured her to abort her unborn daughter with Down syndrome. Courtney Baker said she wanted her former doctor to see how valuable her daughter’s life is and how wrong it is to pressure anyone to have an abortion. Research published in the Journal of the American Medical Association suggests that many women are not receiving adequate counseling about prenatal testing for Down syndrome and other disorders. As a result, studies indicate unborn babies with Down syndrome are targeted for abortions at very high rates. A CBS News report earlier this year shocked the nation by reporting that Iceland has an almost 100-percent abortion rate for unborn babies with the genetic disorder. Other studies put the rate in the United States somewhere between 60 percent and 90 percent. This has prompted legislation in several states in America and in Poland to end the deadly discrimination against unborn babies with Down syndrome. The Grovers said they worry about the discrimination that their son could face as he grows, but they have no regrets whatsoever about choosing life for him. This entry was posted on Tuesday, November 21st, 2017 at 6:22 pm	and is filed under News & Commentary. You can follow any responses to this entry through the RSS 2.0 feed. You can skip to the end and leave a response. Pinging is currently not allowed.